Last month, Ross and Matt Duffer gave Stranger Things fans a demogorgon-esque scare when they told Vulture that their instant-classic supernatural adventure series would only run for four seasons. “We’re thinking it will be a four-season thing and then out,” said Ross. 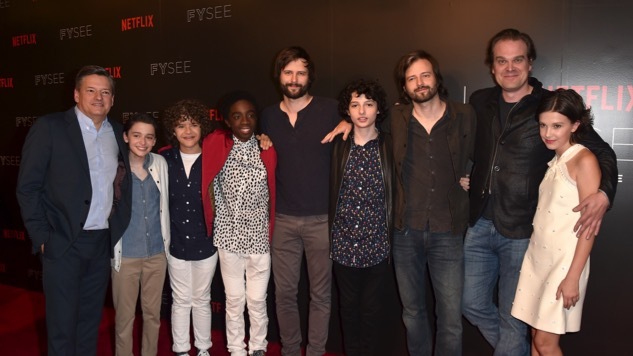 But fortunately for us all, the brothers Duffer appear to have rethought that plan of action, as they and Stranger Things executive producer Shawn Levy told EW yesterday that the show will likely go on longer. “Hearts were heard breaking in Netflix headquarters when the Brothers made four seasons sound like an official end, and I was suddenly getting phone calls from our actors’ agents,” Levy said. “The truth is we’re definitely going four seasons and there’s very much the possibility of a fifth. Beyond that, it becomes I think very unlikely.” So while the strong chance of a fifth season is heartening, it appears we ought not get too excited about Stranger Things sticking around for a long while. The Duffers remain wary of dragging their show out past the point of plausibility. So there you have it, Stranger Things fans. We can’t be too greedy, like Eleven going waffle shopping, but there should be plenty of this show to savor for years to come. Stranger Things 2 arrives on Oct. 27. Read up on all the latest season two details here, revisit the show’s latest teaser here and watch Paul Reiser discuss his role in the sequel season here.